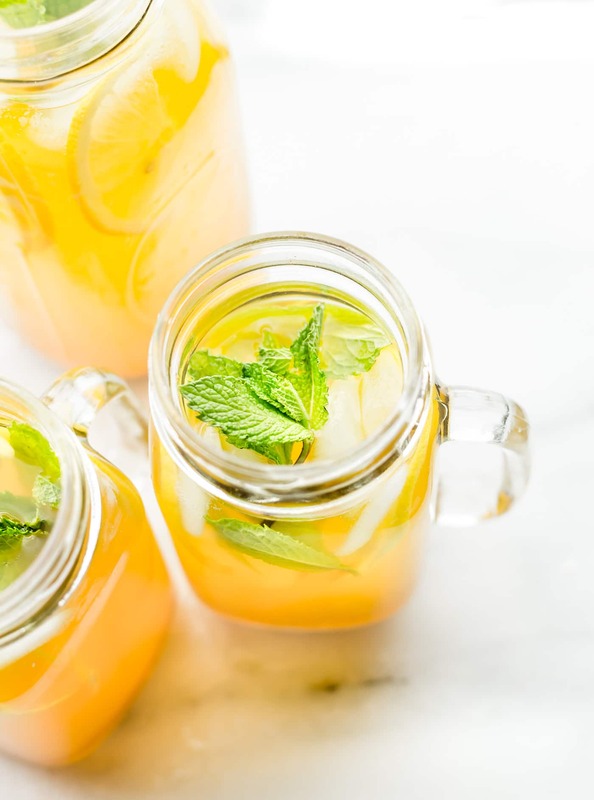 Turmeric Ginger Lemonade with fresh Mint is great for fighting fatigue and reducing inflammation in the body. It’s quick to make, naturally sweetened, and super refreshing! Homemade lemonade with a hint of spice, tartness, and zing! Vegan, paleo, and AMAZING! Just letting you know this Turmeric Ginger Lemonade recipe was originally published in June 2014. I retested, rephotographed, updated content and URL. Now I am republishing it for you today! I hope you enjoy. Thank you for following Cotter Crunch Y’all!. Ginger, Lemon, Turmeric, Maple Syrup (or Raw Honey), and garnish of fresh mint! Yes –> It’s detoxifying, soothing, & alkalizing!! okay ya’ll, before I jump into this post, I want to share why I am reposting. One .. my husband just participated in his first bike race last weekend after retiring in 2015 from Triathlon!! This is why I made those Tropical Bars, remember? But at the same time, he also got sick and overdid it the week before. LOL! Hence this Turmeric Ginger Lemonade with Mint. Soothing, healing, and all things anti-inflammatory. Yes I am on that kick along with Junk Free June. That being said, let’s reminisce on those Pro Triathlon days when I was sherpa wife. You ready to relive it? I am! Here’s an old post from 2015 on how to help prevent/reduce chronic fatigue and boost recovery with FOOD! If there’s two things endurance athletes try their hardest to avoid, it’s Chronic inflammation and Chronic Fatigue. Unfortunately, I think most athletes (pro and recreational) have had their bouts of both from time to time. It’s like the plague! My husband suffered from chronic fatigue in 2009 from over training and under resting. Yep, we learned the hard way, BUT… WE LEARNED early. Which is why I do my best to keep him (us) well fueled/nourished and he does his best to see that he gets that proper recovery. Plus I make us both Turmeric Ginger Lemonade with touch of Zingy MINT! Why am I talking about this? Well, the kiwi (aka my husband) is back from multiple weekends of racing. He has a semi recovery week, then another race, then a full “reset” recovery for 2 weeks. That’s a lot racing and intensity, which of course can cause too much inflammation and free radicals in the body. You need some degree of inflammation in the body to keep healthy, but it is possible for that inflammatory response to get out of control (like with racing, stress, overtraining, toxins, etc. ). The “lull” between races (or even hard training weeks) is where I like to “MAXIMIZE” his antioxidants and anti-inflammatory nutrients. I also like to try to incorporate more alkalizing foods/drinks into his diet to help flush out any lactic acid build up. And since he is resting more this week, he can consume more power green bowls and salad combos, juices, superfood smoothies, etc. without it causing digestive problems. 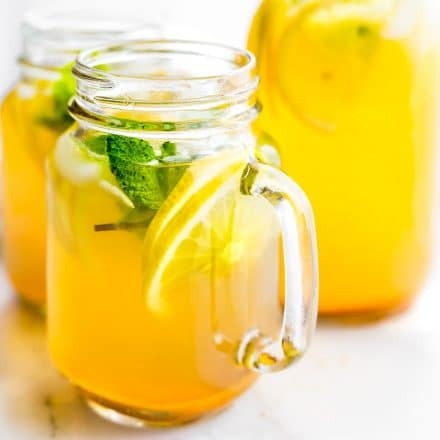 One of the other ways I like to add in these nutrients is by making a Turmeric Ginger Lemonade with Mint leaves to garnish (as mentioned above). I adore turmeric, ginger, and citrus together! It’s such a powerful nutrient combo. Turmeric is a natural anti-inflammatory, antioxidant, antiviral, and is said to be 5x stronger than Vitamin C as an immunity booster. Ginger is right up there, great anti-inflammatory spice and can improve the absorption of essential nutrients. Which we all need right? Better nutrient absorption, less stress, better recovery, feeling good vibes!!! And don’t forget the touch mint! It truly evens out that spice and gives it a soothing refreshing taste. Plus Mint leaves are also great for soothing digestion and sinuses! 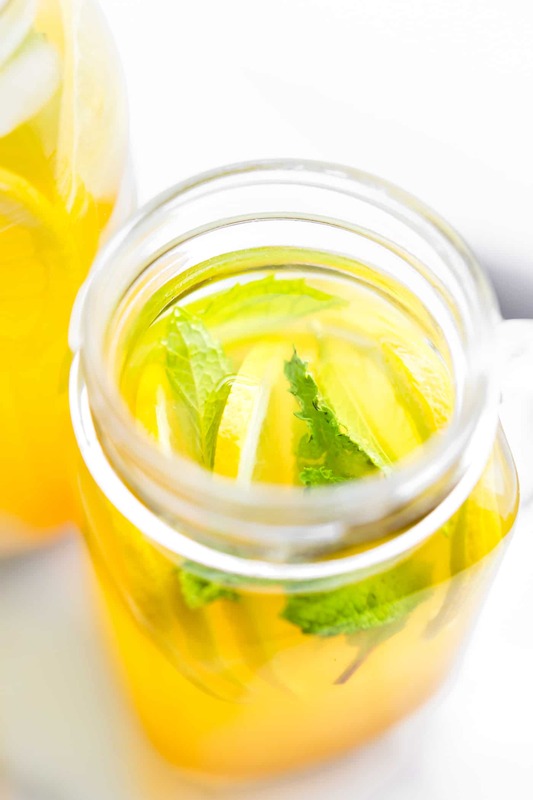 Turmeric Ginger Lemonade with fresh Mint is great for fighting fatigue and reducing inflammation in the body. 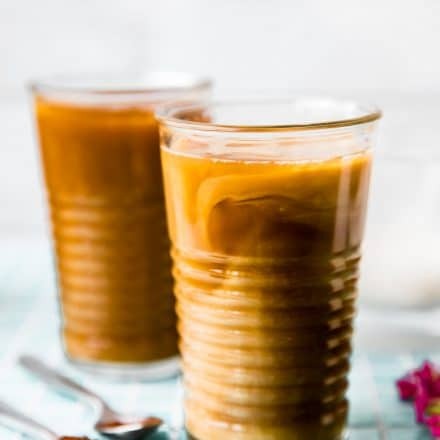 It’s quick to make, naturally sweetened, and super refreshing! Vegan, Paleo. Garnish with extra lemon slices, fresh mint, and store in fridge. Add ice if desired but note it will dilute flavor. Feel free to add ice but it will dilute flavor. Keeping the body fueled with alkaline foods has been pretty easy this week. Well, except my daily glass of red wine. Hey, it’s rich in resveratrol. I’ll take it! Anyway, as I mentioned Monday, this is definitely a superfood drink week! We have been packing in those veggie superfood smoothies. Beets, more ginger, cabbage, and fresh tropical fruit. Today we are sippin on this “HEALING” lemonade tonic and resting a bit more. Yes yes, I know some people view “golden drinks” /juices/smoothies as a way to detox or cleanse, but for us, it’s about ADDING! Calories are not the focus as much as the nutrients are. Needless to say, everyone has a different approach to fueling their body! And to be honest, I think you need to find a happy medium with it. Know which are best for you and when your body needs it. Ya know? So for this week, we’re hitting up an extra glass of turmeric ginger lemonade, red vitality smoothies, and super greens. We should be stronger than Super Woman and Super Man by next week. WATCH OUT! Favorite Recovery drink or Lemonade combo? 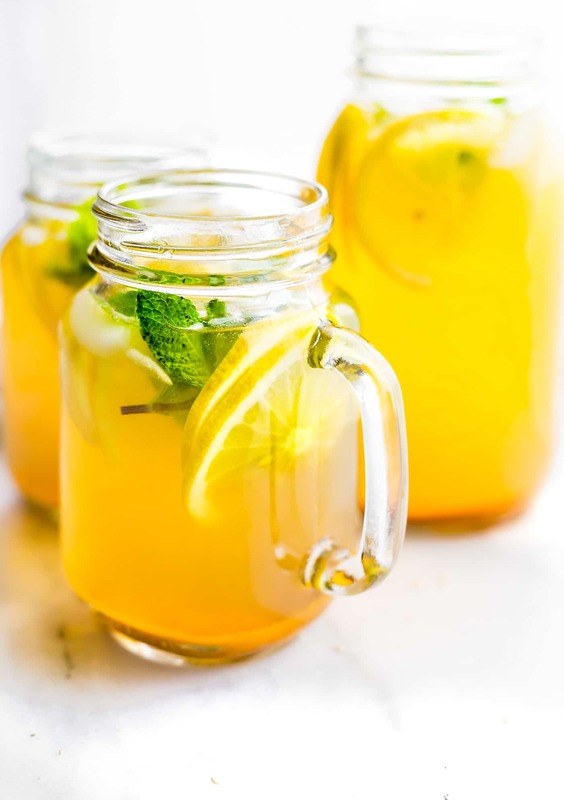 Ever tried Turmeric Ginger Lemonade? Momma Big World is smart! listen to her. And yes, shoot me an email about fatigue, we’ve been through it all. Antioxidants are a truly powerful thing. I so strongly believe in the nutrients in our foods and spices and absolutely notice a difference after long/hard runs when I eat certain foods (cherries/sweet potatoes etc.). I am not really a green juicer at all, more of a recovery drink person or finding the right anti-inflammatories food person. I don’t know, just never got into drinking all those shakes, smoothies and juices. you should add ginger to your smoothies! it is good, promise, just add cinnamon too! This lemonade looks so good! I would never have thought to add tumeric to a drink like this but I am in definite need of some good inflammation reducing powers, especially when it comes to my digestion right now. Favourite green drink is definitely a juice with celery, kale, cucumber, lemon and ginger. So good! I’m more of an organic chocolate milk girl for recovery, but I might need more than that with the increasing temps. Thanks for all of the info., friend! I neeeeeed to try the tumeric’nade. i have a feeling you’d really like this.. a lot! I’ve done a lot of research about turmeric and am sold that you should be adding it in daily! I love the idea for the drink, I am not sure I would like the flavor though! you can’t even taste the turmeric. More ginger and lemonade. I know you’d like Kim! Eeks…ok ok I will try to get the nerve up and try this! I will report back when I do! Ah inflammation… how running does that to my knees! I love taking baths in magnesium salts and know of the benefits of tumeric but have yet to experiment with it. Thanks for the reminder! oh yes, needing one of those baths tonight. So soothing! i feel like turmeric has so many benefits – i always see it in health drinks! Tumeric seems to have such fantastic properties. Love the way you are incorporating it into this recipe. And I am a big fan of rest when rest is needed!! Ahhhh I just want us to live closer! We are so similar in our lifestyles, that is always my focus during intense training and racing periods. I have a lot of curries though, as I can add both the tumeric and ginger, but this would be a lovely drinkable way to make some and save it. Thanks for the post as always miss, although I should be mad at you as now I want us to hang out even more! I love turmeric – I put it in so much stuff – it is really good in scrambled eggs! Amazing combo. I add turmeric to my eggs and anything else I can. Thanks for the recipe! I love kale + apple for juice! I’m a big turmeric fan. Thanks for sharing this one! Ginger + turmeric is a powerful combination! I’m going to have to save this recipe. I know you will love it Lauren! I’m intrigued! For most of my life, I’ve been prone to swelling, specifically in my legs. I went to many doctors, but none of them could come up with a good answer, so I continued to live with it. Now that I’m pregnant, the swelling and inflammation is worse. I definitely need to keep this in the back of my mind and give it try sometime! I’m all for a natural way to help with this issue, so this sounds perfect! oh i hope it does help friend! and maybe Epsom salt baths? I LOVE all-natural remedies for inflammation! 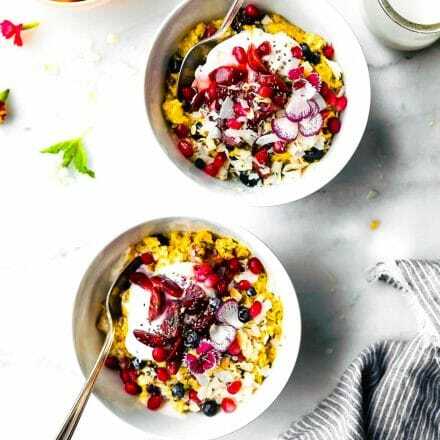 Berries are a staple in our household for sure but didn’t know about tumeric! Interesting! Why have a never had this?!? ooo, this looks too good. I drink my warm lemon water every morning, but I love turmeric and ginger, so maybe I’ll have to try this a few mornings instead! I have never heard of this inflammation/overracing thing…does stress cause that, too? I was soooooo busy in May and I felt like I was “off” the whole month. I lost weigh, didn’t feel great, etc. I am feeling much better after some R&R. oh definitely! stress (any kind) can cause that! 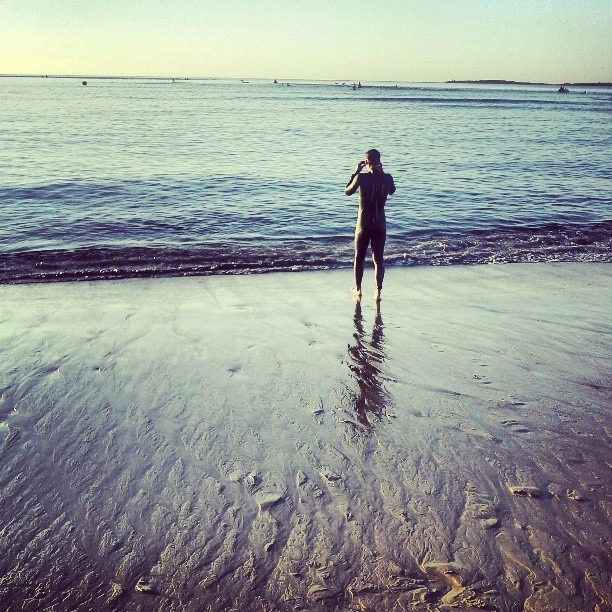 Great post- you’re so right, all the racing and endurance training can really tear our bodies down and increase the inflammation to an extend beyond the normal wear and tear. Your lemonade sounds sooo delish! Yum! I LOVE turmeric and cook with/drink it as much as possible. I had a carrot/green apple/turmeric juice recently that was SO darn good! Making this for sure! oh that juice sounds awesome! i need to make that next! I love your point about ADDING nutritions vs. taking away calories. So important. Ginger is on my sensitivity list (which I am REALLY going to try to follow… finally), but turmeric remains a staple. 100% sure I over-did the ginger, actually. I just love the flavor! I love adding ginger and turmeric to smoothies! I really think it helps me to recover from a tough workout. Wow, that’s a lot of racing! How did the last 2 go for the kiwi? I am aware of the power of turmeric, but don’t use it as much as I’d like to. The thought of trying it in a lemonade is a bit scary, but I’ll try anything once! Daily Greens is expanding – I just tried some last weekend at a Dallas Farmer’s Market and a franchiser is bringing it up here. I tried “Rejuvenate” – it was so yummy! Congrats to YOU on continuing to be such a great sherpa wife! one went well, the other not so well. But it’s all about learning, yes?! 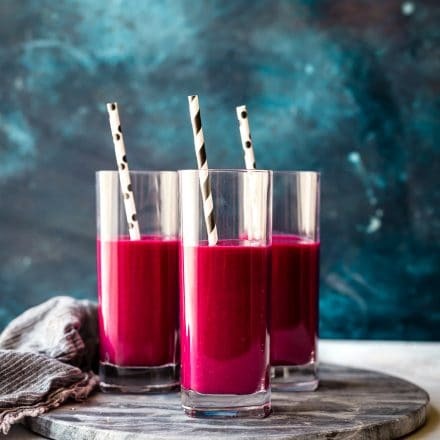 I love the idea of ADDING juices instead of using it for a cleanse. Also, can I just say that you win best wife award for the incredible focus you have on helping your husband recover? I would love to try this as I try to incorporate turmeric wherever I can. Is there something missing from your recipe? I see a missing ) on the line where you have turmeric. Just want to make sure…. thanks! i love garden of flavor brand ‘turmeric tonic’ it’s so zippy! 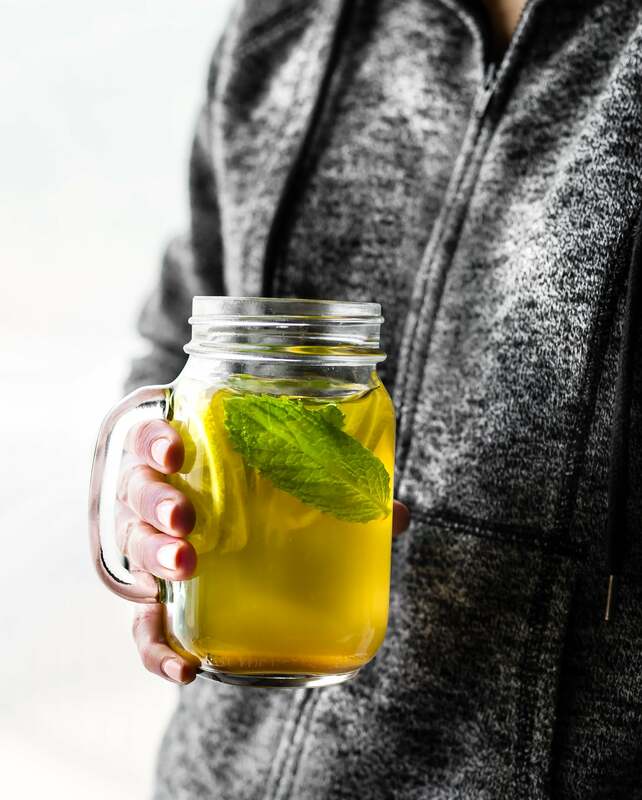 My mom used to feed me ginger and turmeric tea when I was running track in high school – back then, i never appreciated the healing benefits of this combo – but now I do! Wonderful lemonade recipe – thanks for passing it on! I might have to whip up a batch of this for my mom, since I have a feeling her level of inflammation is a little too high and causing all sorts of pesky problems like allergies and chronic sinusitis. The trick, though, would be getting her to actually drink it. you can’t really taste the turmeric. Add honey !! she might like that! I adore turmeric AND ginger! I agree, match made perfect. Mmmm, that Enlightened juice sounds right up my alley, yum! I was just telling my Mom yesterday about tumeric. She has RA and occasionally has flare ups of inflammation. I recommended she add more to her diet. you are a good daughter! You know I think of you as my personal sherpa. Seriously, love reading about how you take care of your kiwi so i can copy what you do. Wish you lived closer. PS- I’m the queen of learning the hard way. Love ya!!!! If I will ever be competing in Crossfit Regionals, can I hire you as my nutritionist please?? yes!! i work for free places to stay in Switzerland, deal? I’ve been meaning to add turmeric – this would be the perfect way this summer!! Love this drink idea! Very smart fueling choices for kiwi’s recovery and I am on the same page with you in terms of juicing. Add in good nutrients! indeed!! who needs to count calories when you have nutrient focus. yes? I take turmeric and ginger everyday! They are such powerful anti-inflammatories that I haven’t taken migraine medicine since January. I just OD on turmeric, ginger, garlic, tart cherry, and Omega 3’s when I’m having an attack- they don’t last as long, and they aren’t as severe. I am living proof that the natural method works– I was having up 24 days a month of pain, for several years– I feel like a new person off of prescription drugs. Ooh, genius! I’ve done turmeric and I’ve done ginger, but never together. I need to try this lemonade. You’ve inspired me to really focus on nutrients and eating/drinking things that will help me and my performance. I’ve been having MAJOR (and super painful) G.I. issues as well and have to wait until July 8 to see my doctor. Really frustrating but hopefully I’ll be able to do a little self-healing until then…or at least experiment with some different things. I swear by turmeric and fresh ginger–both of them make regular appearances in my diet. I definitely need to try this lemonade! I love how much you are helping people with these posts & the gut health posts!!!! Oh I am SO trying this…. I love lemon and I have been reading about all the benefits of tumeric – too good NOT to try! You will love this Lou! Let me know whatcha think! I’ve been reading up on turmeric and trying to incorporate it into my diet. Thanks for these tips and I love what you said about nutrients vs. calories. SO true! This is a great post. Whenever I’m more active, I tend to have problems digesting. I don’t have any tumeric on hand, but I do have ginger and lemons – ginger lemonade it is! oh i hope it helps! keep me posted! This is totally brilliant and simple! Are there any limitations to drinking this? Like don’t drink the entire pitcher in one sitting or do you drink it like you would water? i drink a few cups a day, although i could down it in a minute, LOL! I really need to make some of this lemonade!! I suffer from an auto-immune disease and have issues with inflammation… I have a feeling this will help a lot! i swear by it! let me know if it helps! My favorite green juice combination pear, lemon, mint, and cucumber. So light and refreshing! oh let me know if you do! it’s soo good! Those veggies look great! Did you cook some scallops into them? 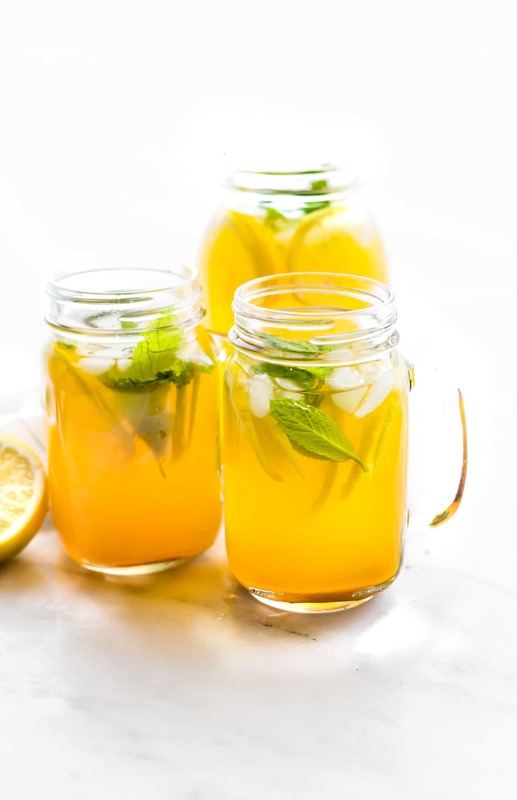 I have to try this lemonade… I’m constantly battling inflammation (I think) because I’m up a pound most days… and I know I shouldn’t be and it’s bloat because my tummy sticks out! I’ll take a big glass of lemonade or some green juice. Much like you, I drink those kind of things because they taste good and for the nutrients they bring. Calories are pretty much the furthest thing from my mind. I knew you were in Texas, but I didn’t realize you were near Austin. ?? Such a fun city, the Hubby has family there. really?! come visit, with granola please! I’ll make you balls. I’m on an anti inflammatory diet because of migraines & I drink this often. I look forward to trying your recipe. Take care. keep me posted! I think you’ll love this one! I started on this yesterday, Lindsay, because I get headaches on and off during the day. Can’t seem to find the source of it despite tons of tests and I’ve been reading that turmeric and ginger are helpful in treating them. I’ll let you know how it goes. I’m using raw honey because I love it! let me know if i can help you in anyway! this tea is a life saver, really! so nourishing. Wonder if the headaches are from allergies or adrenal disfunction. I doubt it’s allergies but never consider adrenal issues…hmmmm. I’ve been taking this every day and feel great. A couple minor headaches but nothing major 🙂 So far so good. Thanks, Lindsay! im trying to get my family and myself away from so many of those drinks just filled with sugar and preservatives from the store… is this something kids could tell didnt taste too much like lemonade… i see all the post but they are about wanting to try it, not if they have tried it already. you have talked me into doing nothing today except lounge around and drink this! you should so do that! You need it! Thank you friend! God does wonders with food, right? Lady, I remember your sherpa wife das so well – and even though I commented way back – I gotta re-comment and say – yum – this is still a stunner! I need a running faucet of this. Dealing with some major inflammatory issues right now! Oh no! Keep me posted! How are things? Delicious. This is just what I was looking for to have a cold way to have a turmeric drink. I have a mint plant that’s gone wild, so I’m using a handful of it. Right? I am sure I have missed some of yours too. We need a reunion of old posts party! I am a math specialist at an elementary school for grades K-6. My position is unique because I only work with the advanced students that need a challenge. We are doing a lemonade stand project for grades 3-6 and I found this resource very useful! The challenge I presented my students was “How much would it cost to make 100 cups of lemonade.” I gave them a recipe and we went at it. We found that having an option for lemon juice in a bottle saved us a lot of money. The lemons were way expensive and you only get 1/4 cup of juice for every lemon. Thank you so much for the resource! Off topic question … what kind of pot is that? Is it ceramic? What brand? It’s so cute! Hi! I’m twenty-one year old college student who was recently diagnosed with IBS, and so I’ve been dabbling with different vegan and gluten free recipes that seem to be much lighter on my stomach than other foods. To find these recipes I’ve just come across them through google, but I noticed the ones I loved the most and kept coming back to came from your blog! I just made this lemonade yesterday and it was really easy and I’m totally in love with it! I’m going to try your gluten free cinnamon bun recipe next because I miss cinnamon rolls so much and I really need that fixing! Your blog has been so great, thank you for sharing these wonderful recipes! I’ll let you know how the cinnamon buns go. Oh I am so glad I can be a resource for you Catherine! I hope your stomach feels better soon. Thank you for kind works. Keep me posted on snap peas! 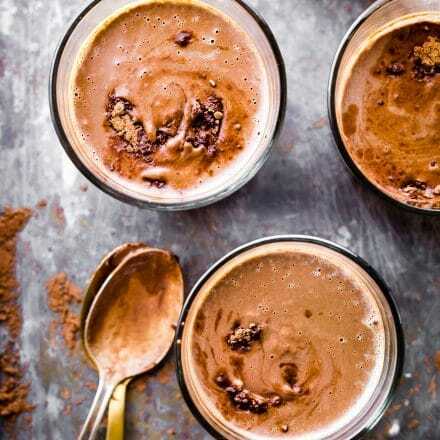 Sounds good……I also put turmeric, ginger and cinnamon in my smoothies! Do you put the pepper in while it’s simmering or do you add after you have simmered and strained? How many cups can I drink a day? I usually put it in while simmering. 1-2 cups a day is great! Looks so incredibly refreshing. Thank you! I added this to my list of turmeric recipes I want to try — http://kaijumaddy.com/2018/07/21/15-anti-inflammatory-turmeric-recipes/ Thank you! Made this was great. but was wondering how much to drink each day of the tumeric ginger lemonade. So glad you you tried it Jenny! I would say a 8-12 ounces a day is sufficient. But you can test it out ot see how you feel too! Thank you, Debra. If you ever have any questions, please let me know. I’m happy this can help with inflammation! This is so yummy, it just feels good drinking it as its so refreshing. Im about to make my second batch! The mint added really finishes it off. Thanks for posting! I love it! Thanks for sharing dawn!